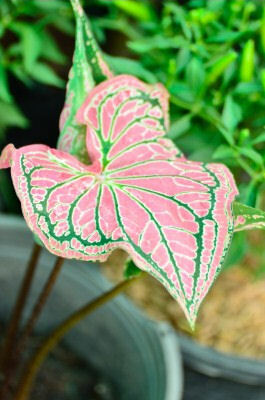 Caladiums are beautiful ornamental foliage plants with brilliantly colored, variegated leaves that are heart-shaped with veined patterns. The leaves come in an array of colors from green pink, reds, silver, cream, and neon pink. They make great houseplants but their paper-thin leaves damage easily from dry air; therefore, place them on a humidity tray or a pebble tray. 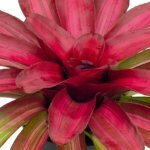 These plants are very rewarding because they can be grown indoors year-round and provide you with spectacular beauty for months. 1. Fancy-leaved types have large, heart-shaped leaves grown on long petioles. They can grow up to 30 inches in height. 2. Strap-leaved types have smaller, narrower, thicker, elongated leaves on short petioles giving the plants a more compact look. They grow under a foot in height. They are used in hanging baskets. The plants are Grown from tubers that have "eyes" which are growing points. These eyes look much like the eyes on the potato. Fill your containers with good quality, well-drained sterilized potting soil. Make sure there are adequate drainage holes to prevent tubers from sitting water as this will cause them to rot. Place the pot in a warm, sunny location. Once the foliage emerges, place in indirect light to prevent the leaves from getting scorched. Light: Indirect light (curtain-filtered sunlight from bright east, west, or south window) or moderate shade indoors. Water: Keep evenly moist and never allow to dry out. Begin watering less in autumn, as plants naturally stop growing. Humidity: Keep humidity as high as practical. Place plant on a pebble tray or a humidity tray. For best results, use a room humidifier. Temperature: The plant thrives in warmth so try to keep at 70 to 75 degrees F during the day and 55 to 60 degrees F at night. 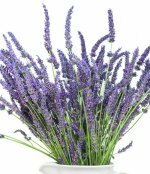 Place the plant in a draft-free area of the house away from air conditioners and doors or windows which open frequently. The leaves will die quickly after exposure to rapid temperature fluctuations caused by drafts. Fertilizer: Fertilize lightly during the growing season with liquid or use slow-release pellets. Propagation: Mature tubers can be divided. Repotting: Repot when plant becomes too large, use well-aerated potting mixture. Special Care: Caladiums go dormant in the fall and their leaves die back. Move dormant plant to a dark area that is around 60 degrees F. Water once a month while the plant is dormant. When spring comes your plant will come out of dormancy. Place it back in its growing spot. These plants have toxic leaves and stems. They contain oxalate crystals which can cause irritation if ingested. Keep away from pets and children.